Klimatisiert Einheit am Riverside Golf Course. Beobachten Sie die Golfer bei einem Drink auf der großen Wrap-around-Deck (eine Seite sonnigen einer Seite schattig). Voll ausgestattete Küche, großes Esszimmer; und Wohnzimmer mit Kamin und 42 'TV. Ensuite aktualisiert Es gibt 3 Schlafzimmer, 1. mit Doppelbett, 2. mit Doppelbett und 3. mit 2 Einzelbetten. 6 Weltklasse-Golfplätze innerhalb von 30 Minuten. Weitere 6 innerhalb einer Stunde. Windermere und Columbia Lakes mit Stränden und Bootfahren in nur 15 min. entfernt. 5 min. Fairmont Hot Springs Pools. Radfahren, Wandern, Reiten innerhalb von wenigen Minuten alle verfügbaren. Weltklasse Skifahren in Panorama (35 Min.) Kimberly (1 Stunde) Lake Louise (90 Min.) Oder Sonnenschein (90 Min.). Heli Ski Innerhalb von 40 Min. Great location, great view, clean and cozy!!! We have been vacationing in Fairmont Hot Springs for 20 years with our family. This is the first year we stayed at this condo on the Riverside Golf Course. Amazing view, beautiful deck to enjoy early in the morning with a cup of coffee or relax at dusk with a great view of the golf course. The condo was very clean and well equipped. It is an exceptional value for our family vacation. We would love to stay there again in the future. So glad you enjoyed your stay. We would love to have you come back again. The condo is very clean and well stocked. The location is close to all of Fairmont’s amenities and about 20 minutes from Invermere. This condo is great for a family of 3-5 people. The owner is very responsive, as well. Great stay! Condo was all that we had hoped for. Four adults were very comfortable in the three bedroom well appointed unit. Beds are comfortable, furniture is in good condition. 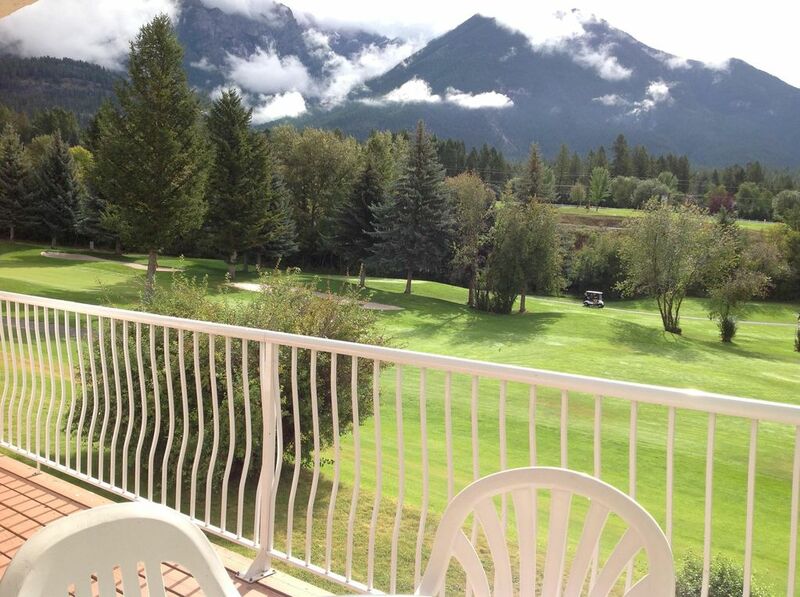 The grounds are well kept, the view over the golf course is restful and the mountain view from the deck is awesome. The unit was clean and well decorated. Could not figure out the TV and VCR, however, we did go there to watch TV. Close to hiking and Hot Springs - great area for relaxing. This condo was great! It was clean and well stocked. Owner is very easy to deal with and answers any concerns immediately. The golf course is beautiful. Across the street is a very nice pool. We will for sure be visiting this place again. Rentals add $100 cleaning fee. Rates are not final until confirmed by owner.